In addition, I absolutely love dogs. I want them to be dogs. My overall goal in training dogs is to bring out the wonderful, unique dog within each dog. I am not hoping, nor am I trying, to make them non-dog. 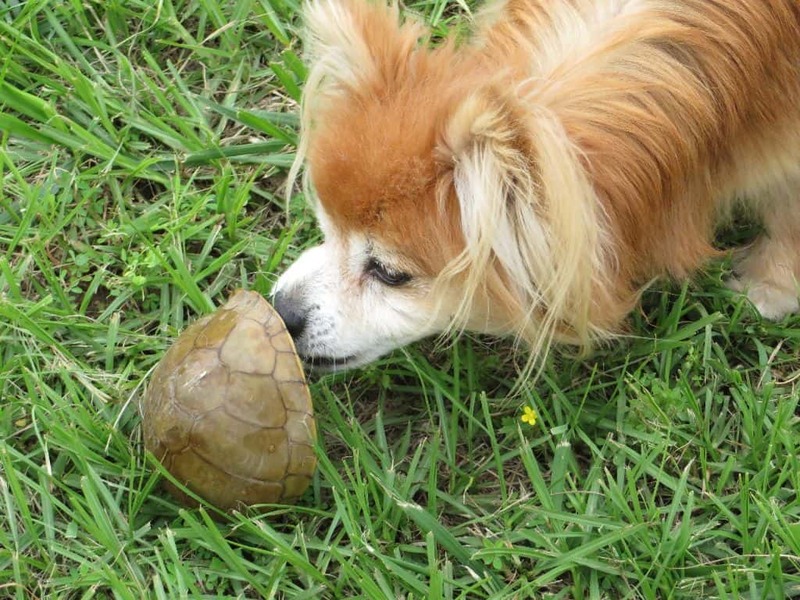 I believe dogs should absolutely be allowed to sniff and collect data about their environments, read p-mail, explore in dog-friendly areas (either off-leash or on a long line depending on fencing/containment, and also the dog’s skill of coming when called), etc. 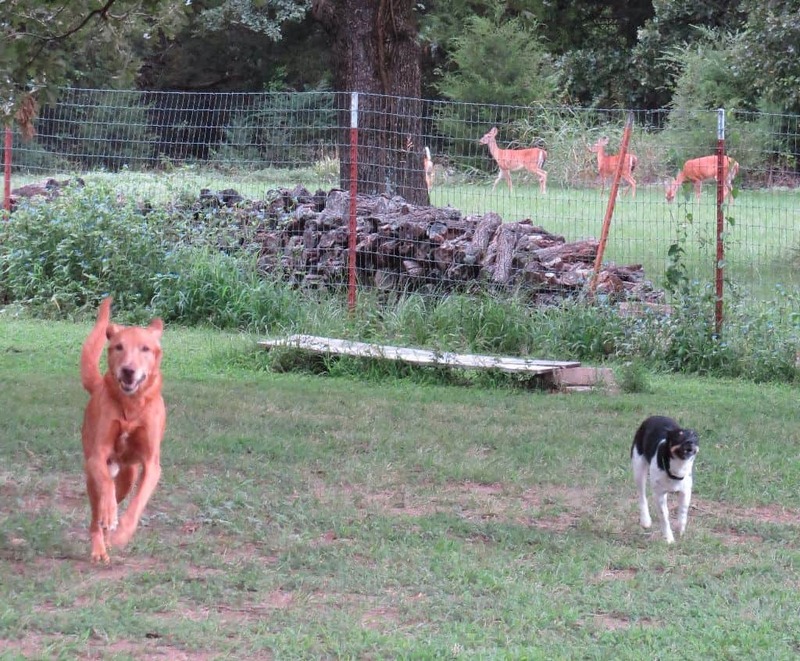 The Plumwood Posse has ample, daily opportunities to enjoy activities like sniffing, exploring, following scent, digging in mole tunnels, barking at deer, chasing lizards, picking apples, playing with toys (solo or with each other), wrestling with each other, playing chase with each other, etc. 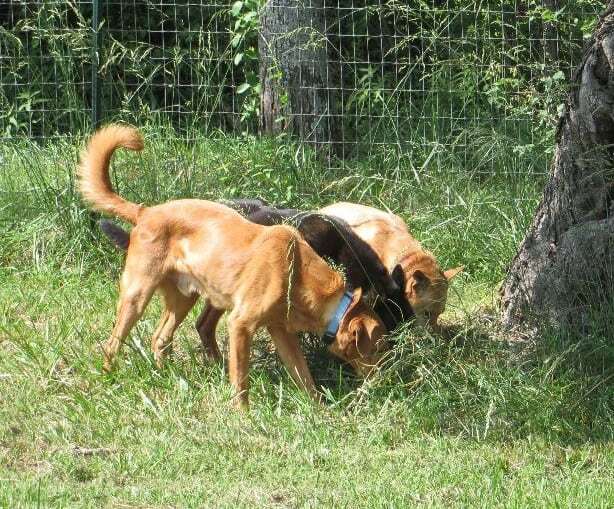 They are free to do so at their own choosing throughout the day while out in the yard, during romps in the field, other outings, etc. Also, I often make use of behaviors such as sniffing, exploring, following scent, digging in mole tunnels, barking at deer, chasing lizards, picking apples, playing with toys, wrestling with each other, playing chase with each other, etc., to reinforce other behaviors such as walking on a loose leash, offering me their attention, responding to me when I say their name or other attention-getter word, and coming when called. Sometimes I do this in the setting of a formal learning session* and other times its rather informal and simply occurs as part of everyday life (see example at bottom of post). They enjoy these behaviors daily and frequently. 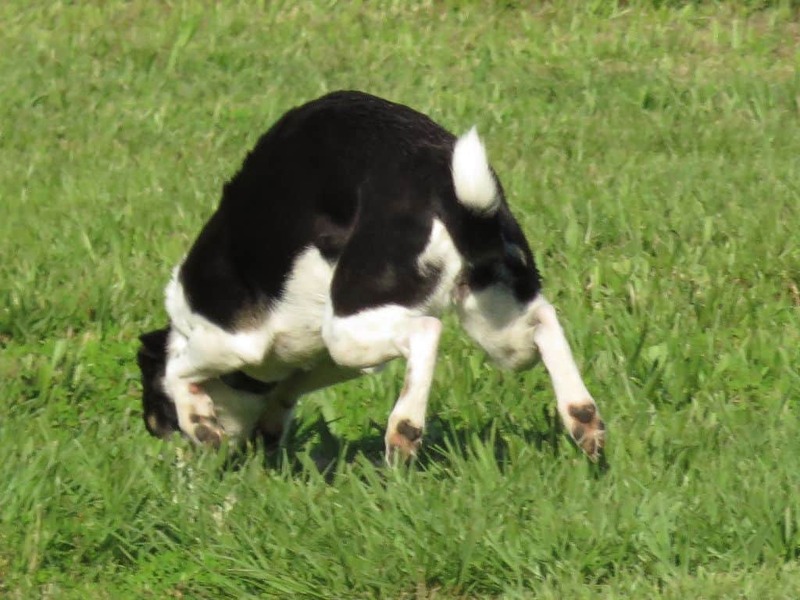 However, while letting our dogs enjoy activities like those listed above and many others, it is important that we maintain awareness of what we are teaching (intentionally or not), what we are reinforcing (intentionally or not) and what our dogs are learning. This is especially beneficial in early stages of training. I believe supervision and management are key ingredients for a harmonious home. Combined with formal learning sessions, they are crucial components for strengthening desired behaviors while minimizing undesired behaviors and need for damage control. Life in the SMART Zone extends beyond formal learning sessions of practicing repetitions of sit-stay and polishing loose leash walking skills. It is a lifestyle, it’s how to live with your dog so both of you are happy, healthy and safe. Learning is always taking place – for better and for worse. Keep in mind, behaviors are not the only things being learned. Emotional responses are also being learned, i.e., conditioned. 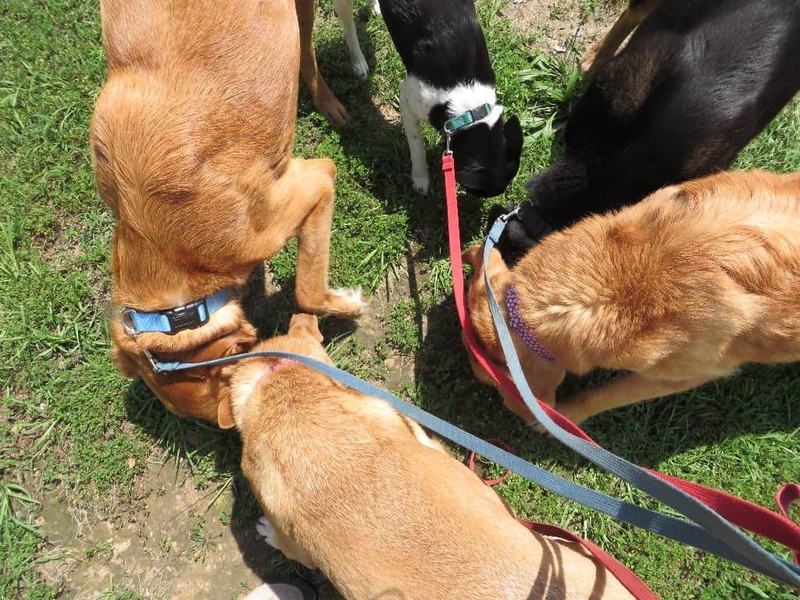 I try to stay aware of what my dogs (the Posse and my canine students) are learning, what behaviors they are practicing, which emotional responses are being conditioned, and what habits we are developing. By doing so, I help ensure my dogs are practicing desired behaviors and emotional responses, and developing into safe and happy dogs. By doing so, I make my life easier as well! Once progress has been made and we’ve established a safe, happy home, I can begin to relax – though not do away with – the training sessions, supervision and management. Perhaps another way to look at supervision and management combined with formal learning sessions is that they help provide behavior guidelines. The guidelines are to ensure health, safety and harmony. These guidelines are in place whether we are in a formal learning session, or an everyday life situation, e.g., on a walk, on an outing, they are playing with me or each other, or we are “just hanging out” around the house. 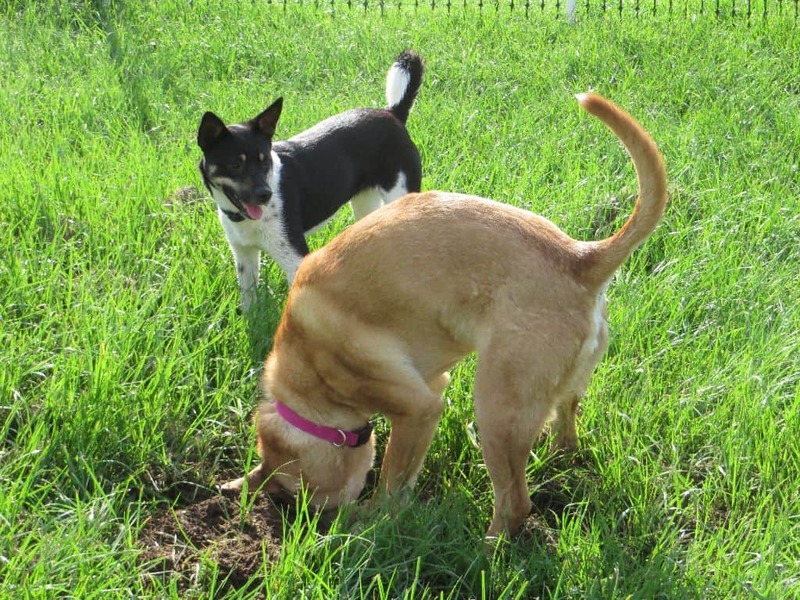 While letting my dogs enjoy activities such as sniffing, exploring, following scent, digging in mole tunnels, barking at deer, chasing lizards, picking apples, playing with toys, wrestling with each other, playing chase with each other, etc., I do not want these situations to end in a “free for all” where “anything goes!” I do not want them to end up in a dangerous situation. I do not want them to end up over-aroused, over-stimulated, frustrated, volatile, and/or aggressive. I do not want them practicing undesired behaviors and undesired emotional responses. Training, supervision and management are part of my lifestyle, my habits. Its how I live with dogs, how I teach dogs. This comes from living in a multi-dog household for the past 12 years (and 14 of the past 22). It also comes from living with and working with fearful, aggressive and reactive behavior in canines for the past 16 years. (More on those topics in future posts.) But it also comes from living and working with a single dog, and dogs who are not experiencing issues with reactivity, fear or aggression. It is important for all dog owners because it improves the safety, health and behavior of any dog. It also helps prevent, modify and reduce fearful, aggressive and reactive behavior. Let your dog be a dog? Absolutely! 24/7. 365. Just be aware of what he is learning, what he is practicing. For safety, health and harmony, keep an eye on his stress, impulse, arousal and frustration levels. Teach him self control skills. Help him develop safe and healthy behaviors as he expresses his inner dog. By all means, let your dog be a dog, just please let him be a happy, healthy, safe dog. 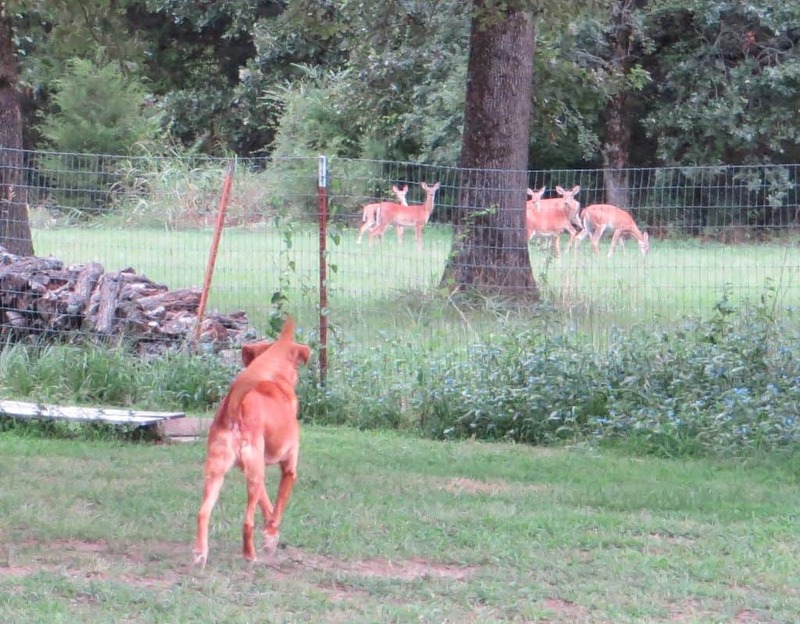 The photos below show several Posse dogs on two different occasions barking at deer in our back field (left column). Despite their excitement, they promptly respond (right column) when I give a cue, for example, their name or “come”. This allows me to not only regain their attention but to also give them a short break and control their arousal level. After the short break (which is often only seconds in duration), I might release them to resume the behavior and go bark again, or I might have them join me elsewhere in the yard or house. These situations also allow us to practice response to cues amid high distraction. They enjoy it as yet another fun game we play, and so do I. It’s win-win-win. 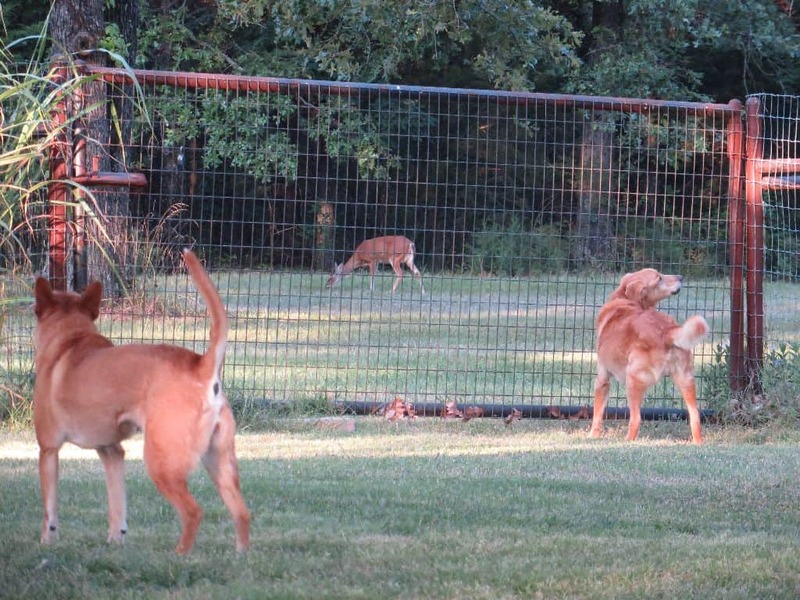 Note, many of the deer who pass through our property habituate to the Posse’s presence and barking, and are not overly concerned. 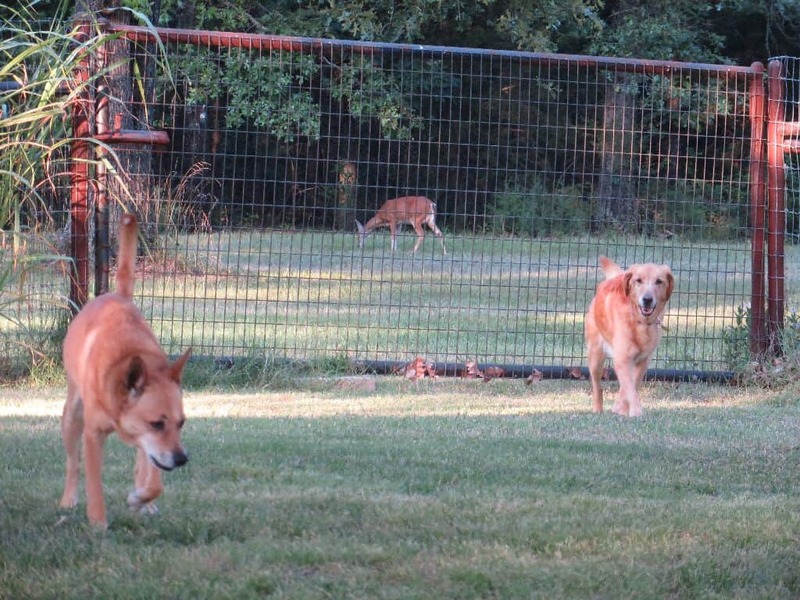 They often continue grazing, or re-emerge to graze after a brief retreat, while the dogs are at the fence. I’m certain they and Geronimo were on a first name basis. 😉 However, my presence makes them uneasy and if I move closer they usually run deep into the woods. Thank you Robbie! Glad you enjoyed it. Hi Mary and The Plumwood Posse! I’m only seeing this now – many, many congratulations! I look forward immensely to receiving any and all updatest to which I’ve subscribed. I haven’t read all the blogs yet – just wanted to say how happy I am you are now blogging. You have so much to contribute ~ and most of all I love that we appear to be on the same page regarding our philosophy on dogs – living with them, training/teaching, and most of all learning from them. Shelley was always ‘allowed to be a dog’ and walks were HER walks (I just kept her safe) and though we live(d) in an urban area she enjoyed sniffing, scenting, on lead, off lead, playing/training (which were the same to her) and generally loving our interaction. Hello Therese, Thank you. Starting a blog has long been on my list, wonderful to now have it launched. Early Spring launch was pushed back due to Geronimo’s illness and then his passing. I felt G “with me” as I wrote this post and several others, I’m sure he’ll continue to guide me, just as Shelley guides you. 🙂 Great to connect with you here. Thank you for your kind words. Love all the picture and the extra info we might not learn in class..!!! 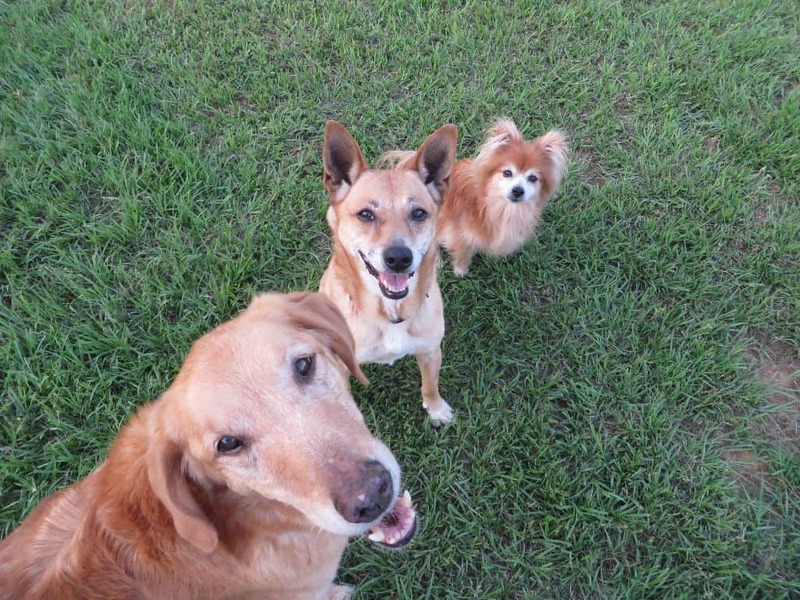 Thanks for visiting and commenting Judy, Harley & Lucy. 🙂 Yes, there is always so much wonderful info, hard to squeeze it all into an hour class. Great to see you here! Great post! I agree dogs should always be allowed to be dogs as children should be allowed to be children. This means lots of curiosity and exploring but NOT unruly. Mikie and I have learned a great deal from training with Smart Dogs. Thanks for the information you are continually posting!